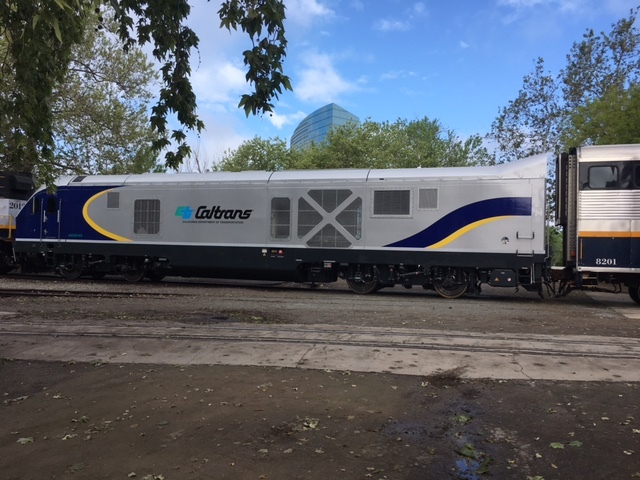 SACRAMENTO, CALIF., April 18, 2017 — Amidst vintage rail cars at the California State Railroad Museum, the public got its first official look at one of the newest locomotives soon to be on the rails: the Siemens Charger Clean Diesel-Electric Locomotives. The California-built, environmentally-friendly Charger locomotives will begin operation of revenue testing on the Capitol Corridor service before the end of this month. Officials on hand for the 2017 California Passenger Rail Summit, taking place in Sacramento April 18-19, celebrated the arrival of the clean locomotives. The locomotives are the first high-speed passenger locomotives to receive Tier IV emissions certification from the Federal Railroad Administration (FRA). The new locomotives, six in all for Northern California, are part of a larger, multi-state procurement. 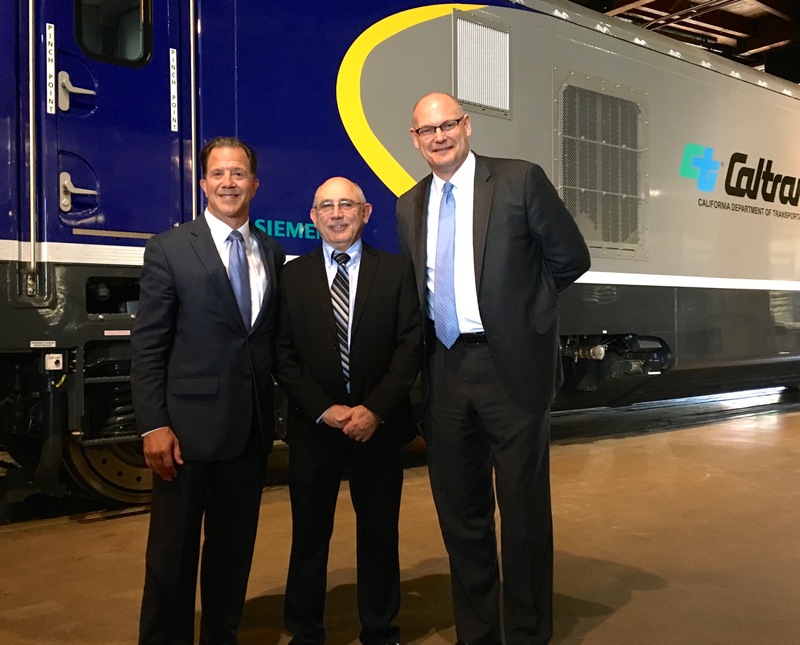 Siemens is building the Charger locomotives out of its nearly 1,000-person rail manufacturing hub in Sacramento, California for transportation agencies in California (Caltrans), Illinois (IDOT), Washington (WSDOT) and Maryland (MTA). Additional states served by the procurement are Oregon, Wisconsin, Missouri, Michigan and Iowa. Each Buy-American compliant locomotive costs approximately $6 million—funding for the California locomotives came from Federal Recovery Act Funds and California Proposition 1B Infrastructure Bonds. The Charger locomotive is powered by a high-performance, environmentally friendly, 4,400 horsepower-rated Cummins QSK95 diesel engine, and are designed to operate at speeds up to 125 miles per hour. The powerful diesel-electric operation allows for better acceleration, cleaner emissions, and low noise levels for passengers on-board and waiting at the platform. The Chargers also feature an attractive streamlined design and smoother traction control which results in better ride quality for passengers. The Charger locomotives are equipped with electronically-controlled regenerative braking systems that use energy from the traction motors during braking to feed the auxiliary and head-end power systems to minimize fuel consumption. Also, the new Charger locomotives, using the QSK95 Cummins engine, provide a 16% improvement in fuel efficiency over the non-Tier 4 certified locomotives that the Charger will replace in Washington and California. The Charger locomotives are expected to begin a 30-day period of revenue testing on the Capitol Corridor before the end of April. Once testing is complete, they will begin service on the Capitol Corridor and San Joaquin routes. About Capitol Corridor®: The Capitol Corridor is an intercity rail service connecting the most economically vibrant urban centers in the Northern California megaregion – from the Sacramento capital, to the tech hub of Silicon Valley, and including San Francisco, Oakland, and Berkeley. With a Cafe Car and free wi-fi on board, Capitol Corridor trains provide a convenient, reliable, and comfortable alternative to the congested I-80, I-680, and I-880 freeways for both work and leisure travelers. The extensive network of bus connections further extends the Capitol Corridor’s reach to destinations like Reno, Lake Tahoe, Santa Cruz, and Monterey. Together, these systems serve the second-largest urban service area in the Western United States. The Capitol Corridor intercity rail service was made possible by Californians who voted to provide capital funding for passenger trains in 1990, and is managed by the CCJPA. The CCJPA partners with Amtrak, Union Pacific Railroad, Caltrans and the communities comprising the CCJPA to offer cost-effective, viable, and safe intercity passenger rail and offers a convenient way to travel between the Sierra Foothills, Sacramento, the San Francisco Bay Area, and Silicon Valley/San Jose. For more information visit www.capitolcorridor.org. Join us on Facebook and follow us on Twitter. About CalSTA: The California State Transportation Agency is responsible for transportation-related departments within the state: Board of Pilot Commissioners, California Highway Patrol, California Transportation Commission, Department of Transportation, Department of Motor Vehicles, High-Speed Rail Authority, New Motor Vehicle Board and Office of Traffic Safety. For more information, visit www.calsta.ca.gov. About Siemens: Siemens Rolling Stock business unit is part of the Siemens Mobility Division which provides efficient and integrated transportation of people and goods by rail and road – including all products, solutions and services regarding mobility. Siemens designs and manufactures across the entire spectrum of rolling stock including commuter and regional passenger trains, light rail and streetcars, metros, locomotives, passenger coaches and high-speed trainsets. In the U.S., Siemens is providing rail vehicles, locomotives, components and systems to more than 25 agencies in cities such as Washington D.C., New York, Boston, Philadelphia, San Francisco, Denver, Salt Lake City, Minneapolis-St. Paul, Houston, Portland, Sacramento, San Diego, St. Louis, Atlanta, Norfolk and Charlotte. Cities also rely on Siemens to provide traction-power substations and electricity transmission, as well as signaling and control technology for freight and passenger rail and transit systems. Siemens has transportation manufacturing hubs in: Sacramento, CA; Louisville, KY; Marion, KY; Pittsburgh, PA.